This is a guest post by J. Stephen Addcox who recently completed his PhD at the University of Florida with a focus in Victorian literature. In the fall, he will be joining Georgia Tech’s Writing and Communication Program as a Brittain Postdoctoral Fellow. His research is on the intersections of memory, testimony, and narrative. Remember when everyone used to line up to eagerly await the release of the next chapter of the newest popular novel? Probably not, unless you are a 200 hundred-year-old vampire, since serialized publication of novels both rose and fell during the nineteenth century. But back when it was common, stories about the anticipation of new releases were also standard. Reports about the arrival to America of the last issue of Dicken’s The Old Curiosity Shop has been retold so many times that it has taken on a somewhat mythical quality. 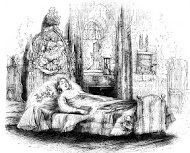 Reportedly, the novel’s popularity was such that throngs had gathered to await the last installment’s arrival, and when the boat finally arrived, a cry went up asking whether the beloved character of Little Nell had lived or died (figure 1). There are few contemporary cultural moments that parallel this nineteenth century experience. Figure 1: Spoiler Alert: Nell Dies. The cultural events that we do line up for (movie releases, new video games, concerts) do not share the serialized distribution design that typified Victorian publishing practices, and those that are serialized in the twenty-first century (television and video game series) are usually accessed and consumed at home; no need to line up to watch (or download) the latest episode download of Game of Thrones. But even in television (in American at least), serialized narratives, in which a coherent story is told over several installments, have until recently been less common than simply episodic narratives. While HBO and other networks have shown that the serial has great potential, video games have also experimented with this form of distribution. TellTale’s The Walking Dead is probably the most noteworthy and successful example of a game that thrived as a serial narrative. Figure 2: Lee’s protective relationship with Clementine was an emotional focal point across the series. (Figure 2) In fact, video game developers and publishers seem to be embracing the nineteenth-century idea of a staggered release schedule more and more (for good or ill). Now we see that more and more games are (in the negative view) released with minimal functionality so that more features can be monetized through microtransactions, or (in the positive view) that games can capitalize on a staggered release schedule to offer more expansive narratives. At the same time, a serialized approach to releasing videogames that are distinctly narrative presents a potential difficulty for most of us, because we are accustomed to being able to play through games as quickly (or as slowly) as we like. The point is that we often control the pace of our play, and as a result, the narrative’s progression. Of course, this freedom can lead to difficulties with games boasting epic storylines, like those in the Elder Scrolls series, especially if players take some time off from the game. Several months ago, I began playing Ni No Kuni, a game that I enjoyed, but that I haven’t been able to make time for of late. The result is that if I began playing today, I’d have to spend some time reacquainting myself with what was going on in the story when I left. Figure 3: What do all these menus do, again? But this lapse of memory is ostensibly my own fault; I decided to stop playing, and as a result, I’ve lost the game’s narrative thread. In a way, video games have offered increasingly sophisticated tools to help alleviate this problem: interactive maps, detailed quest guides, and in some cases cut-scene galleries. But what happens when the video games themselves are published serially, a slow-release approach to digital narrative that, as I have already suggested, mirrors that of nineteenth-century serialized novels? Suddenly, my ability to take up a game and put it down again is removed. If I want to play the game as it is released, I become beholden to the game’s publishing schedule; otherwise, I have no choice but to wait until the game is released in its entirety and play from beginning to end. Granted, on the surface, this dilemma has all the hallmarks of a great “first world problems” image macro, but games like The Walking Dead do more than simply offer a minor annoyance to those of us who would prefer more power over a game’s narrative progression. It is not uncommon for cultural critics, journalists, and academics to posit a relationship between the kinds of media that we consume and how we think. (A cursory search on Google scholar gives several examples of studies that posit links between thought processes and television, advertising, and other forms of media consumption.) There may be differences as to how far this relationship goes or whether it should be cause for concern, but the idea that our media influence our minds is shared across a wide variety of disciplines. However, we should always be careful to avoid the misconception that this link is peculiar to our time or our recent technological developments. The xkcd comic “The Pace of Modern Life” offers an ideal way of recognizing that new forms of communication and storytelling have often been viewed with a wary eye. So if our video games are adopting a serial approach to distribution, and considering that this form of narrative attained wide cultural saturation in the nineteenth century, perhaps the nineteenth-century thinking about the relationship between narrative and the mind might offer some insight into how we can expect to experience these narratives today. 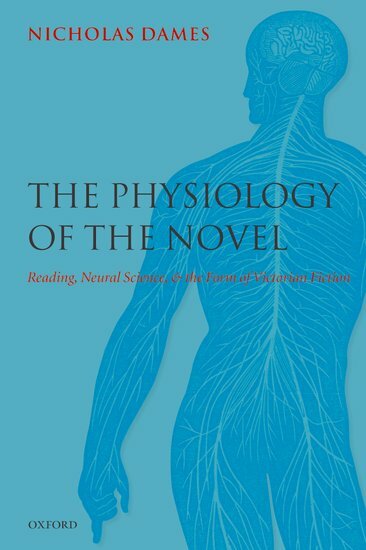 Nicholas Dames, a scholar of Victorian literature at Columbia University, shows how the new (at the time) field of physiological psychology, in which the study of the workings of the mind and the body were conflated into a broad field of science, pseudoscience, and cultural criticism, had a unique conception of how readers of fiction approach narrative (figure 4). Physiological psychology, in Dames’s description, “posits a short-term-memory-only reader, who experiences the narrative as a series of affective ‘moments’, or, in other words, as a rhythm” (57). This rather radical formulation of how we experience narratives has significant implications for how we play serialized games today. Consider the question that we often ask a friend who may have seen a movie, read a book, or played a game about which we have little knowledge. “What’s it about?” we might casually inquire; but this question is fraught with several assumptions about how we experience narratives, and how we should report that experience to others. In the scenario I’ve posited, we probably expect that our friend will condense the major concept of the work in question, give a sense of narrative in terms of genre and creativity, all while making sure not to drop any spoilers that might impact our experience of the work at a later time. But what if our friend reported not a series of plot points or generic conventions, but offered a series of emotional states that the work produced? We would probably find such a response puzzling and a little bizarre, but perhaps the serialization of video games makes it more likely that we return to a game with a sense of the narrative’s emotional impact rather than its specific details. When the first season of TellTale’s The Walking Dead was being released, I played each episode as it came out. As many commented at the time, TellTale’s take on The Walking Dead franchise provided a great experience of immersive narrative, combined with a sense that players were making substantive and meaningful contributions to how the story in each episode played out. But episodes were released about two months apart, which meant that I often returned to the game with only a vague sense of what had been going on when the previous episode concluded. I have written elsewhere that this distribution model is particularly apropos to this franchise because it models a kind of traumatic fog of memory that would be associated with the terrifying events depicted in the game. But I’d also like to suggest that serial release impacts our sense of time in video games. If a game like Jonathan Blow’s Braid offered players direct control over time by allowing us to reverse the flow of events, then The Walking Dead conversely illustrates the immediacy of time. Furthermore, because of the interval between releases, my recollections of each episodes specific narrative had faded enough that what remained were my memories of emotions, just as the Victorian psychologists emphasized in their analyses of novel reading. In other words, serialized video games might be (paradoxically) better suited to providing especially immersive gaming experiences–the rhythm of emotions that such games offer could prove more enduring than the specific narratives that they inhabit. 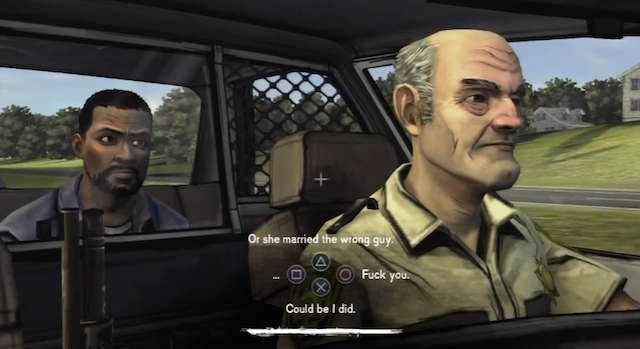 As a result, The Walking Dead’s conversation mechanic, in which players are given a limited amount of time in which to make pivotal decisions, ratchets up the tension precisely because the full impact of a decision might not play out until the next episode (Figure 5). Figure 5: Time limited conversations created a sense of pressure throughout the series. When the next installment rolls around, that sense of tension and stress remains even if the specific narrative context for that emotion has faded. This continuity of emotional engagement is not dissimilar from the logic of MMOs, which are predicated on the notion that players will continually return to the game over a long period of time. What is distinctive about serialized video games like The Walking Dead, however, is that they have a beginning, middle, and end–those three traditional components of narrative. This means that unlike an MMO, which can linger on interminably, serialized video games offer their players a sense of emotional rhythm that can be sustained, but which is also moving toward a conclusion. The presence of a conclusion allows the game’s rhythms to resolve themselves, providing players with a sense of harmonious resolution (even if the narrative itself signals the possibility of a sequel, as The Walking Dead did). If we are to see more games released as serial narratives, then game developers will have to introduce storytelling structures into their games that allow players to participate in this rhythm, return to it, and achieve a sense of familiarity, like listening to a song you haven’t heard for some time, all while allowing that our particular memories might have faded in the time since we last played. Perhaps such developers might be interested in taking on the challenge of reading a Dickens novel month by month for two years. In the late 90s the Dickens by Inches project asked readers to do just that, and they found that many participants struggled with the drawn-out process of engaging with a novel for so long. In anything, this project simply shows that it’s important for us to appreciate what challenges and advantages serial distribution present. As digital distribution becomes more and more pervasive, the temptation to piecemeal publication will grow, but with luck, we’ll be able to see a time when video games both reach into the past but also challenge the ways in which we experience interactive narrative.